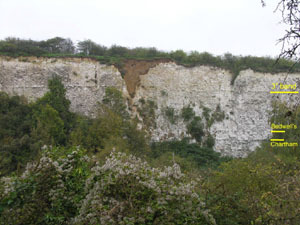 The Francis Chalk Quarry at Cliffe is designated as a RIGS because it demonstrates the distinctive nature of the Upper Chalk in the Thames Estuary region and because of its historical significance. The site also has good educational potential, particularly because of its proximity to the Royal Society for the Protection of Birds (RSPB) Cliffe Pools reserve with its planned visitor centre. The designated chalk site lies south of the River Thames, at the northern-eastern edge of the complex of former clay pits that now forms the RSPB's Cliffe Pools reserve, adjacent to the village of Cliffe. The quarry derives its name from Francis and Co., a London-based company that started manufacturing cement at Cliffe in 1860. The company was taken over by the British Portland Cement Company in 1900 and was phased out in 1920. Cement manufacture continued until about 1950 with Alpha and APCM, and the works finally closed on 1st April 1970. The chalk quarry RIGS and former clay pits of the RSPB reserve are a reminder of the area's cement-making past. 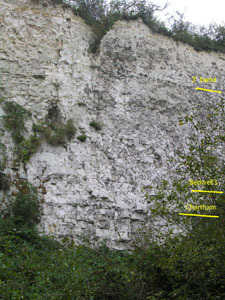 The designated section exposes the upper part of the Micraster coranguinum zone of the Upper Chalk. In the Thames Estuary region this chalk has a distinctive character when compared with east Kent. Nevertheless certain flint bands and beds of fossils allow detailed correlation not only within Kent (for example, the RIGS at Chartham Hatch) but throughout the Anglo-Paris basin. One of these flint bands (Bedwell's Columnar Band) is associated with large vertical flints. 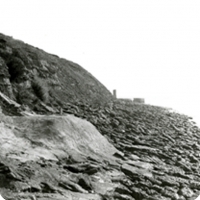 When the site was active during the late 19th and early 20th centuries, chalk was excavated by hand and the site was an important source of fossils. It thus has an important place in the history of Earth Science. Francis Chalk Quarry was surveyed for designation as a RIGS in December 2005 by Professor Andy Gale and Dr. David Wray. The exposure may be viewed from within the RSPB reserve (see the top photograph), which has free pedestrian access via a network of trails, and a viewpoint that overlooks the quarry. Parking is possible at the end of Salt Lane at the boundary of the RSPB reserve, or outside St. Helen's church, in nearby Cliffe village. Permission to enter the chalkpit must be obtained from the owners. Care must be exercised when visiting the chalkpit as the faces are vertical and hence there is a risk of falling debris though the faces are mature and stable. The trails are also uneven under foot.